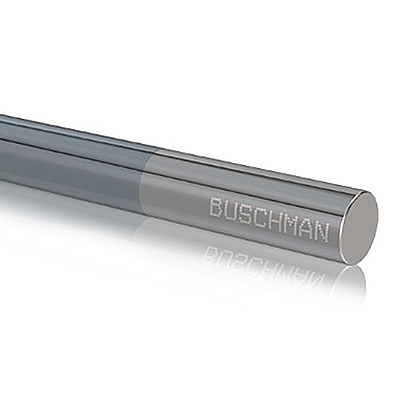 Buschman smooth metering rods are precision-manufactured to deliver consistent coating coverage, dependable performance, and long life that reduces costs and optimizes efficiency in your day-to-day operations. Whatever your application, Buschman can provide a smoothing rod tailored to your needs. Smoothing rods are primarily used to apply clay coatings to paperboard, and to distribute higher viscosity coatings evenly and smoothly. Many Buschman customers use a smoothing rod as a follow-up process to a metering rod or other coating method to create a smoother coating result, especially when using high viscosity coatings. Buschman is the only smoothing rod manufacturer that manufactures everything in-house. Our quality standards are second to none, resulting in rods that ensure precision, consistency, and stability. Up to exceptionally hard triple chrome (0.075mm thick) plated. Dura-Life chrome plating eliminates macro cracks & increases density. Good for multiple web width applications. Buschman rod holders are precision manufactured to give the rod a more uniform and consistent fit along the entire length of the holder. Our rod holders reduce rod vibration, increase rod and holder life, and promote a more uniform coating. We manufacture rod holders from Hot Cast Polyurethane (PU) and Polyethylene (PE).